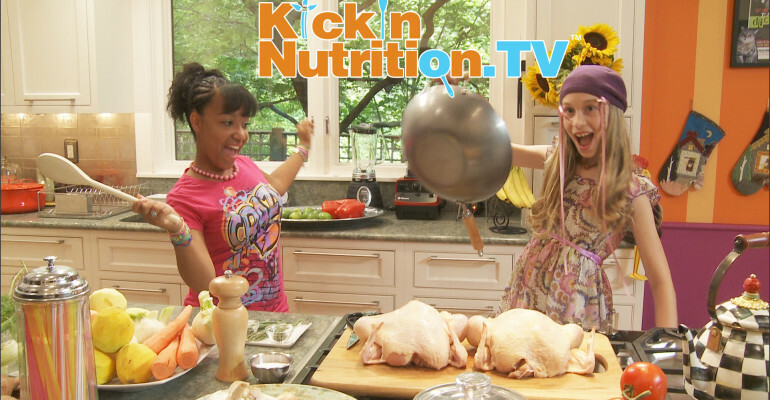 Pilot tested and evaluated in 2014, in collaboration with a team of experts from Boston University and with expertise of advisors from Harvard School of Public Health and Tufts Friedman School of Nutrition Science & Policy, KickinNutrition.TVoffers a fresh entertaining dish where teens are teaching kids about food. Kids are loving the program’s video game, StudenTopia where teenage avatars take over of their school cafeteria. Kids earn badges and rewards for engagement as they move from “Dishwasher Level” to “Top Chef Level” and students can share recipes, photos and videos with their classmates in the “Shared Kitchen,” a safe online environment. Celebrity guests appear in episodes such as, rising superstar, Jared Sullinger of the Boston Celtics, NFL 2011 MVP, Greg Jennings, and celebrity Chef Daniel Boulud, and soon, Mario Batali will prepare a kid-friendly, healthy recipe. As you will see, all the celebs have a lot of fun with the program. The Mario Batali Foundation announced support to distribute KNTV at no cost for New York City Title 1 schools during 2015-2016, along with generous support from the Heckscher Foundation for Children. The inspiration for KickinNutrition.TV came from my experience as a Sesame Street International Executive Producer during the 1990’s creating original, foreign-language versions of Sesame Street in Russia (Ultisa Sezam,) and in Mexico (Plaza Sesamo) for Sesame Workshop. I witnessed first-hand, on location in Moscow, how a TV series could help transform a nation and promote democracy through an episode where Russian children vote for crayons or juice! KNTV’s interactivity, scalability and cost-effective delivery model satisfies the hungry, growing cadre of food-obsessed youth and educators who are sharing viral content about food, friends and their lives online. “KickinNutrition.TV has that kind of edgy feel, especially for my middle school students…in the past, teaching nutrition to kids and making it interesting can get really difficult. So they vest interest in characters that are in the program… it gets them involved, paying attention, I love hearing the excitement it’s creating wanting to make meals at home like Reyna and Stacy so I think that’s really good”. When children question about how the world works, often they turn to the Internet for the answer. Using technology to provide wide-scale, affordable food education for all, in tandem with access to healthy school meals legislated by the congress, is an excellent recipe to reduce childhood obesity rates among children and adolescents. My hope is that KickinNutrition.TV will level the playing field so that all children will have access to the tools they need to make healthier choices and we can prevent obesity and the diseases that are impacting our children’s futures. The evidence-based curriculum has demonstrated an impact on health knowledge acquisition and health behaviors, based on scientific research by Dr. Paula Quatromoni of Boston University and Philliber Research Associates.